People often ask what led me here. How I decided to become ER nurse, and how I keep going down a path that can be full of so much pain and trauma. My answer is this. I survived this. Everyone has a story, that one defining moment in life that changes who you are, or what you will become. This is mine. I was just a kid, a happy-go-lucky teenage girl enjoying the summer. Blissfully unaware of the harsh realities of this world. My life was perfect and pretty, nothing bad could ever happen to me. Bad things don’t happen to good people, right? At least that’s what I thought back then. I know better now. My most beloved cousin had a brand new baby and the cutest preschooler I had ever seen. As soon as school let out for the summer I made a mad dash for Kentucky to spend a couple of weeks visiting with them and helping with the kiddos. I loved spending time with her, she was fun and spontaneous. She had one of those sparkly personalities, you know, the ones who contagiously make the world better just by being. She loved with everything she had and I wanted to be just like her. Man, I miss her now. She was so excited, they were going out to a concert, the first date night since the birth of the baby, and I was going to keep the kids. We packed everything up and made the hour-long drive from their sleepy little town of Danville to the big mall in Lexington. She needed a new outfit, and we were on a mission to find the perfect one. The early hours of that day are full of good memories, we jammed out to loud music in the car, ate yummy double stuffed cookies at the mall, and laughed until it hurt at every silly little thing. If I would have died that day with her, I would have died happy, not knowing all the future that was ahead of me, but living life in the moment and feeling loved. What you don’t know can’t hurt you. We started our trip back home, in fact, we almost made it, and then tragedy struck. I’m not sure exactly what happened in the moments leading up to the accident. I don’t know if I was asleep, or if the human brain is just really efficient at blocking out details that don’t need to be remembered. Either way, it’s probably for the best. I remember waking up trapped in the car, it was hot and loud and I wasn’t quite sure what was happening. I must have blacked out again because the next thing I remember I was on the side of the road. I could hear Parker crying, but I couldn’t find him, everything seemed surreal. The best way I can describe it is, it’s like you are in slow motion, everything moves at a strange speed and people are talking but you can’t understand what they are saying. I knew we had crashed, but I thought I might be dreaming, and I physically pinched my arm trying to wake myself up, surely this can’t really be happening. I made my way towards the car, I could see Parker still inside and someone attempting to pull him out, he was crying and his little face was covered in blood. I walked around the front of the car and made moved towards the driver seat, I could see her there, not moving, riddled with injuries whose images will live only in my head forever. My gut knew, right then, but I couldn’t face the truth. It was just too much. I could see Paxston’s car seat, and what seemed to be a crowd of people hovered around his tiny body. He wasn’t crying, and every one seemed scared and shaky, I knew then something must be terribly wrong. The ambulance arrived and the medics strapped Parker and I to back boards and sped off in route to the ER. I tried so hard to be strong, we were all alone, two kids, fighting for our lives, and leaving behind something that in the end would define us both. I couldn’t die, I told myself it wasn’t an option. I had to stay alive and make sure they knew who we were. I couldn’t leave Parker. He was just a baby. I vividly remember rolling into the ER, my clothes cut off, a mask on my face; covered in blood, sweat, glass, and asphalt. Much like many of my patients now. We were met at the door by a rush of people, all talking…over me, around me, about me, but not to me. All working fervently to save my life. You know, we are so good at our jobs, but sometimes we can forget about the person on the table, the one trembling inside. Even I, after all of this, can be guilty of letting the acuity of the trauma override the need for human connection. After more IV’s, CT scans, X-rays, and assessments than I can remember, a sweet nurse handed me a phone. It was my parents, they were just about to make the 5 hour trip to be by my side and they wanted to hear my voice before they left. I could hear my dad trying not to break down and the rushed fear in my mother’s whisper. Those are two of the strongest people I have ever met, as a mama myself, I don’t know how you stay calm in the face of fear like that, especially when you are hours away and completely powerless to help. 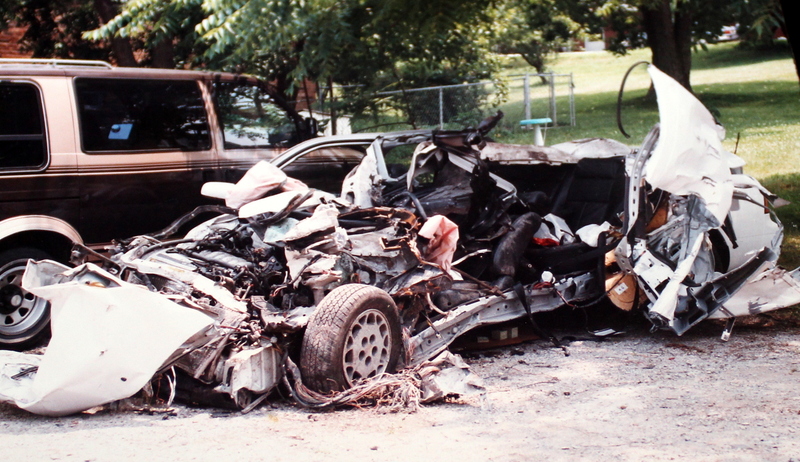 I wanted to know what the car looked like, my perception was skewed and after my parents told me that Anne and Paxston were both killed I insisted on someone bringing me proof that the damage warranted this kind of causality. I could not wrap my head around it any other way. My dad went to the towing yard and took this picture for me, I have had it for more than half my life and I still bring it out from time to time when I need a little clarity or perspective. He hadn’t yet seen the car himself and I don’t think he knew exactly what he was facing. He has told me as an adult that at first he honestly thought their deaths were a fluke, and that it wasn’t until he climbed into the back seat of the car, and sat where I had been, that he knew it was quite the opposite. The fact that Parker and I survived is nothing short of a miraculous. My memories of the days that followed are spotty. The hospital, my family, the tears, the pain, the funeral, the people, so many people, coming and going. Some I knew, some I did not. The lines wrapped literally around the building, hours long, when they were laid to rest. It’s tough, such intense emotions connected to a time that shook the ground beneath me. I find myself thinking about this day when I am standing in the trauma room. You know that few minutes before the patient arrives, when you’re all leaded, gowned, and gloved. Just waiting. Usually cutting up with the trauma surgeons or talking about whatever craziness is taking place in the rest of the ED. I think about what the patient is doing at that very moment, and what they have just been through. Sure, it’s our job, and it’s easy to task out the person; but reality is, that patient’s life has now been forever changed, and they are somewhere in the back of an ambulance crying, praying, fighting for their life, just like I was. Hoping that we are ready, that we are on our game, and trusting that we will save their life. I know it’s hard in our line of work not to get jaded, not to feel over worked, over whelmed, and under appreciated. Not to let the weight of our job bring us down. But let me tell you this. Every person you take care of has a story, has a life and a background that we know nothing about. The mama who is freaking out over a fender bender could be me, we think she is silly, and inside she just relived every second of the worst day of her life. The drunk homeless man yelling in hall, was an attorney until he lost his family in a house fire and he just never made it back. The 25 year old anxiety, just lost his father to a massive MI and is scared to death. The frequent flyer psych patient who drives us all crazy, has a PHD and lost his battle with depression when his kids grew up and moved away. Their terror comes from a place that can not be seen by the naked eye. What’s so incredible to me about all of this is we have power to be there, to be the best part of their worst day. We can talk TO them, not just over them. Hear them, and reassure them that we are going to take good care of them. We can listen, take just a few extra minutes and be present in the moment. Validate their fears, it’s OK to be scared. I am telling you it means so much to the person on the table. These people are in crisis. Their story may not be like mine, it may be something that we find insignificant and silly, but truth is, nobody comes to see us because it’s fun. Each person we meet is fighting a battle we know nothing about. So smile, keep your chins up, and know every single one of you does incredible work. You change lives, you make a difference, and you are valued more than you could ever know. I don’t remember the names of the people who saved my life that night. The people on scene, the men who pulled us out, the medics, the doctors, the nurses. I wish I did. I remember some of their faces, and I most certainly remember their kindness and their reassurance. They were present in what was undoubtedly the most horrifying moments I have ever faced. I am so thankful for you, for all of you. You led me here. In loving memory of Anne and Paxston.